If your client is a good driver but just go to pieces on the day of their test then this script can help to float through the driving test without any anxiety or nervousness. 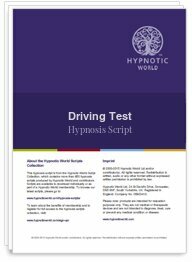 This hypnosis script was used recently with a client who had failed her test twelve times. Fortunately for her it was lucky thirteen. If you are using it with your client then we recommend that you try to have a hypnotherapy session with them as soon as possible before their test is due; alternatively it can be used a few times to reinforce the suggestions contained in this hypnosis script. Note: The script behind this audio session is based on the UK driving test and could vary in other countries outside the UK.